This time I bring a new method to mix fluids with using Graphs in RealFlow. Thanks to the help of Alex Ribao from Next Limit I would like to share this graph to mix two fluids using the temperature channel of the fluids. This idea is not mine I took it from Thomas Schlick https://rftoolfactory.wordpress.com/2015/01/21/fluid-blending/, but instead of using py script we use Graphs that is faster in calculations in some cases. This a pretty simple scene of two fluids, yo can set different properties, as viscosity, density, etc. 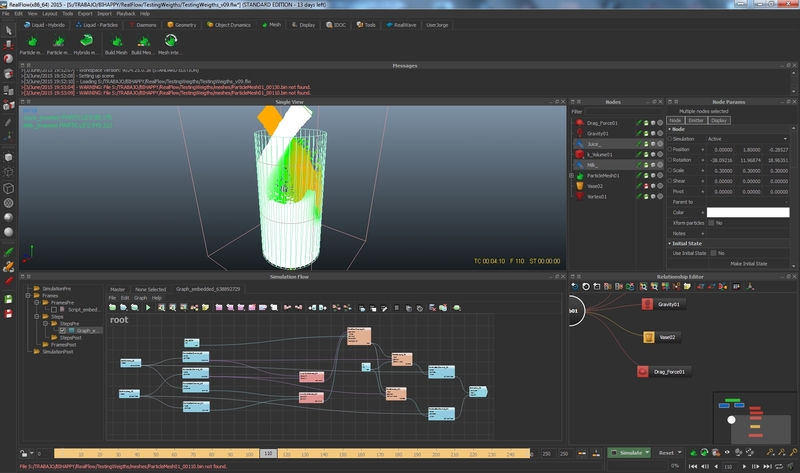 Even using this method I think you could do it more complex and mix properties between fluids. But firstly I would like to prevent you that exist some tricky things in this method that we have been aware. By default liquid emitters have not temperature channel so to create them we have to switch them to Gas and we should set the temperature to 0 for one and to 1 for the other and switch again to Liquid, so we had the channels created. Once done this we only need to load the Graph to the stepPre slot in the Simulation Graph. The graph is quite simple, the particles from both emitters are loaded and read positions and temperatures, then through creating a distance field the particles transfer the temperatures between them and these are updated. The mixed area can be controlled with the CellSize node, although you can add extra control in the rendering process too. For rendering, this time I used Arnold through RenderKit, now I am testing the workflow with Maxwell and will try in VRay too. This are the connections for Arnold. This simulation is part of the work from Pamen Pereira, a renowned artist in contemporary art. Neither does the sea sleep! (Tampoco el mar duerme!) , in this piece, Pamen Pereira has reduced the boundless sea that never sleeps until confining in a container of furies , metaphor or transcript of emotions. To carry it out has had the latest technology in the field of 3D applied to the movement of fluids with Real Flow simulator. I participated doing all simulations, render and lighting. This project took me a very long time due to the length of simulations and took several weeks to do a lot of tests for the finals simulations. This graph helps to order your sims in folders related to your name scene. To use it , plug it in the SimulationPre folder in the Simulation Flow Panel. It has a little problem in the updating cache process, so it is possible when you open the scene next time you will need to execute the graph clicking on the “Execute Graph” button before update the cache in order refresh the global variable with the name of the scene. This graph is similar to the old script IDOC Subversion script.